The mysterious ‘whirlpool hole’ appeared out of nowhere above the city of Al Ain in the Gulf State. Whilst the rest of the sky was a bed of consistent cloud, this circular phenomenon punched a clear hole into the stratosphere, allowing light to bounce down into the desert. 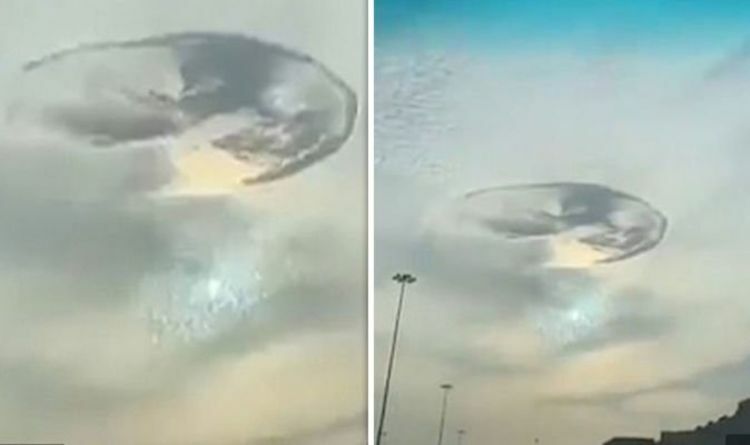 Astronomer and meteorologist Ebrahim Al Jarwan posted a short video clip of the hole on Twitter, adding that the “rare and beautiful” sight was referred to as a 'Fallstreak hole' or 'hole punch cloud'. One user replied that it looked as if "God has thrown a stone into a lake", while others pondered whether the strange phenomenon had been caused by an extraterrestrial UFO. But meteorologists weren't having any of it and demystified the dramatic formation with a scientific explanation. The phenomena tend to form in mid-to-high level clouds made up of supercooled water droplets - water below 0°C but not yet frozen. This is the 'fallstreak' that occurs in the middle of the cloud - which is essentially snow. It causes the surrounding crystals to evaporate, leaving the prominent gap in the clouds. Because of their rarity and inexplicable appearance, it is not uncommon for these magnificent anomalies to be mistaken for UFO trails or some kind of alien presence. Ebrahim Al Jarwan said the phenomenon has not been seen in the UAE for a decade. He said: “It can stay for two hours but generally it lasts between half an hour to one hour." The one in question was fleeting, lingering for only 15 minutes.